According to The National Institute of Dental and Craniofacial Research more than 10 million people in the United States suffer from temporomandibular joint (TMJ) problems. Temporomandibular Joint Disorder is also the most common cause of facial pain. About half to two thirds of people with TMJ disorder will seek treatment and 15% of them will develop chronic temporomandibular disorder. Keep reading this article to find out what TMJ disorder is, whether you have it, how it’s treated and other valuable info about this disorder. Temporomandibular joint disorder doesn’t refer to only one problem associated with this particular joint, but entire spectrum of them. So, what is temporomandibular joint? The temporomandibular joint is defined as the joint that connects your lower jaw (mandible) to the temporal bone at the side of your head. You have two temporomandibular joints, one on the each side of the jaw. TM joints are flexible and they allow your jaw to move smoothly up and down allowing you to talk, chew, or yawn. However, this joint can suffer some injuries that lead to disorder that we know as temporomandibular joint disorder. Temporomandibular joint disorders are a group of medical problems that can cause pain in your jaw and in the muscles that control it. The joint is severely damaged due to blow or other powerful impact. Temporomandibular Joint Disorders Causes can include injuries, wear and tear due to aging and some behavioral factors. For example, heavy blow to the jaw can fracture the bones of the joint or damage the disc which disrupts the smooth motions of the jaw and causes pain. Furthermore, some frequent motions you make can also be one of the causes that promote the occurrence of this disorder e.g. chewing gum, teeth grinding and clenching, chewing on one side of your mouth only and many other reasons. Basically, anything that causes a change in shape or functioning of temporomandibular joint can also cause disorder and pain. Scientists believe TMJ disorder usually occurs as a combination of several different causes. Locking of the joint, difficulty to open or close your mouth. Some people with TMJ disorders also experience clicking sound or grating whenever they open their mouth or chew. Cause of this sound or grating sensation is disc that is in abnormal position, however if they aren’t accompanied by pain, no treatment is required. NOTE: if you experience severe pain that won’t go away, you should see your doctor. Women are more likely than men to suffer from joint diseases. Muscle Disorders – They include pain in the muscles that control jaw function as well as the muscles of the neck and shoulder. 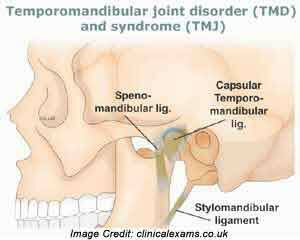 This is, also, the most common Temporomandibular Joint Disorder Type. Derangement Disorders – Are related to derangement of the TM joint e.g. dislocated jaw, injured bone or displaced disk. Degenerative Disorders – Associated with wear and tear of the TM joint e.g. arthritis. They lead to destruction of cartilage that covers the TM joint. Due to the fact that exact cause of TMJ disorder is unknown and people usually experience different symptoms, it can be quite difficult to diagnose this disorder. Furthermore, there is no one exact and standard test that would serve for the purpose of diagnosing TMJ and in most cases description of the symptoms you feel and physical exam provides information for diagnosis. Press on areas around the jaw to identify sites of discomfort or pain. In some cases, your doctor may order X-ray if he or she suspects the problem is with your teeth. CT scan provides detailed images of bones involved in the joint, and MRI can reveal problems with the joint’s disc. Medications – help relieve the pain associated with TMJ disorders. Depending on the severity of the pain you feel and factors that contribute to disorder, doctor might recommend pain relievers, antidepressants, muscle relaxants, or sedatives. Therapies – non-surgical therapies for TMJ disorder include bite guards, physical therapies with exercises to stretch and strengthen joint muscles, and counseling. Other procedures associated with TMJ disorder treatments include: arthrocentesis (inserting needles into joints so that fluid can be irrigated through joints in order to remove bacteria and debris), injections (botox or corticosteroid injections may relieve pain associated with TMJ disorders), and surgery. Millions of people experience TMJ disorders and they are the most common type of facial pain. This group of disorders occurs due to still unknown reason, but other factors can contribute to their development e.g. poor posture. However, you can successfully treat this disorder and relieve the pain with medications like Theracurmin HP and even some exercises that are beneficial for TM joints.